Faith and love could cost them everything. When Rislene Namani meets Eric Hoffmann in 1994 France, the spark between them ignites a firestorm of trouble. She fears the repercussions from her staunchly Muslim family for her attraction to a Christian. Yet Eric captures her heart. More than that, his faith captures her soul -- a faith she comes to embrace. And it all stirs up a wasps' nest of danger, mystery, and love that could cost her everything, even her life. The risk is real, especially when Rislene's family discovers her secret. 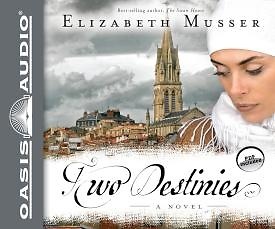 Eric must save her from a forced marriage in Algeria. As the civil war in Algeria escalates in the midst of Ramadan, and poverty and social ills in France boil over, their lives become as tumultuous and uncertain as the world around them. Clinging to faith, they fight a battle as contemporary as today's headlines.